Returns accepted within 14 days only if damaged, please contact me should you wish to return a product with reason for return. Fabric Pots - place a plant pot inside, don't forget to put the saucer in the bottom and don't over water (14cms diameter max.) or a jam jar/vase of flowers. Sturdy outer fabric (interlined) and lined.. Delivery will be made within 5 working days of purchase. International buyers please contact me prior to ordering to confirm a postage price. Any returns need to be made within 7 days of reciept, where..
As the order is a custom one, it will not be possible to refund your deposit. 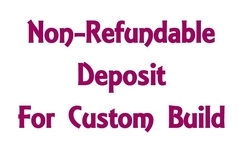 Please pay a non-refundable deposit for a custom order. Delivery will be either royal mail second class or my hermes depending on quantity ordered. Returns within 14 days. 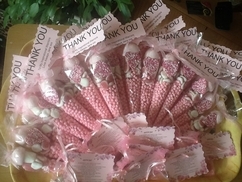 Valentines sweet cones; 190g mini marshmallows, pink foam shrimp, heart marshmallow, harribo heart throbs, chocolate jazzle hearts and raspberry millions. 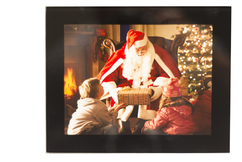 Orders which have been personalized cannot be returned Faulty goods will be exchanged Delivery will normally be 5 to 7 days after an order is placed, however to allow sourcing certain materials..
Pictures are made to order, frames come in a choice of white,black and oak and also come in different sizes. Background colour of background, names and dates can also be added. Pictures are for all family.. This small model kit has been designed by us and is easy to build. Made from card and the solar cell and solar motor are already soldered together for ease of construction. Contents 1 x Correx..
Order Timescales Orders will be dispatched by Royal Mail Second Class signed for service within 7 working days of payment. Postage & Packing ~ UK addresses. postage and packing is calculated.. Items will only be refunded on return and if damaged due to being handmade to order. 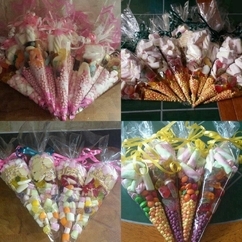 Bouquets can be made in many different colours and themes, and personalised to sut any occasion or event. They can be all chocolate, or all sweets or a mixture of both. They can be personalised to the..
14 days return policy as per the Consumer Contract Regulations 2013 which give you the purchaser the right to cancel the purchase within 14 days after the day you receive the item. 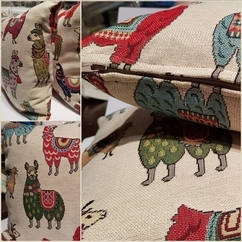 Returns are accepted..
Beautiful bespoke hand crafted Funky Llama Llamas Animal Fabric cushion Tapestry fabric 80% Cotton 20% Polyester Measurements approx 30 x 30cms Ideal home decor, personal gift, gift Removable washable..
All items are handmade to order so please allow sufficient time for delivery. No returns on personalised items. Only available on the booked day fresh on a stick. Or available in tubs before an event. 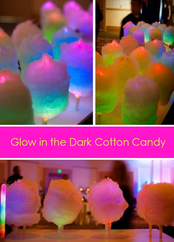 Giant multi flavoured and coloured candy floss. Delivery will be within 7 working days of purchase. Any international buyers please contact me prior to ordering for a postage cost. Any returns need to be made within 7 days of receipt. where a full.. This is a beautiful Gemstone bracelet made with Sea Sediment Jasper stones ,offered for healing and inner peace with love & clarity. I have also used Green Ghost Quartz potato beads with frosted Miyuki..
Once your item has been delivered it cannot be returned, but if it is damaged in anyway please get in contact with pictures and we can get it sorted. you can cancel no later than 5 days before item.. 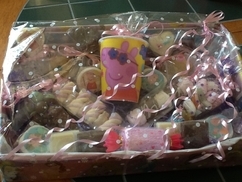 I offer bespoke hampers for all occasions. 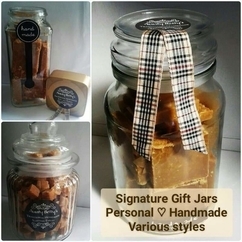 The Valentine hampers can be for him or for her, which can include wine, beer, spirits, as well as soft toy, bought or handmade chocolates, sweets including.. I accept returns within 21 days of purchase, buyer is responsible for return postage costs. I cannot accept the return of personalised items. 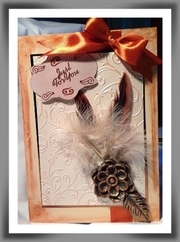 Engagement Wedding or Anniversary card with flowers and feathers I started with bronze card and beige cardstock (adorable scorable) the edges of which I guilded with an antique bronze wax. I then used..
No refunds if item is customised/personalised. Item can be return for refund. Postage to be covered by purchaser. Highly scented Very Vanilla fragrance x10 Top quality 100% natural soy wax. High concentration of fragrance. 100% natural. Please note due to the nature of the product some damage may occur in..
Due to the fragile nature of the gift, I will need to send the plate by Recorded Delivery. Before posting, I will email a final picture to check you are satisfied with the gift. By request, I can also.. 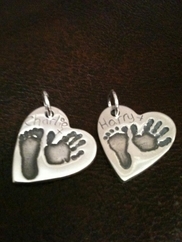 Looking for a bespoke and personal gift for a special couple ? Why not order a hand-painted plate with wedding or anniversary message, dates and names. Choose from some designs below or I'm happy to take.. Delivery will be made within 5 working days of purchase. International buyers please contact me prior to ordering to confirm postage costs. Any returns need to be made within 7 days from receipt, please.. 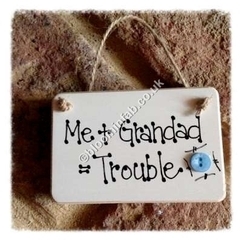 This was a fun plaque to make and I think will appeal to you!. This was made using 3mm MDF with decoupaged background with a variety of chickens!! I have used red ribbon to hang, with wooden beads on..
BASED ON THE OLD FASHIONED SEASIDE PUNCH & JUDY BOOTH. THIS KIT COMES WITH THE TEMPLATES PRINTED ON 2 X A4 WHITE CARD ( THE PHOTO SHOWS MINE COLOURED IN) AND THE PUPPETS ON AN A4 CARD WITH 6 WOODEN STICKS.. Delivery will be made within 5 working days of purchase. Any international buyers please contact me prior to ordering to confirm postage Any returns need to be made within 7 days of receipt, where a.. I love this bracelet, I have used Red Onyx drop stones with Amazonite gemstones, fitted with a lobster clasp. These stones offer healing & energy powers. A special Gift for someone for a birthday or.. Delivery will be made within 5 working days of purchase. International buyers please contact me prior to placing your order, so a postage price can be confimed Any returns need to be made within 7 days.. These Hoop earrings are just lovely, I made these with using Red Onyx Gemstones with AAA graded Semi Precious stones/Red Tiger eye stones!. These offering Healing & Energy powers. These earrings come.. 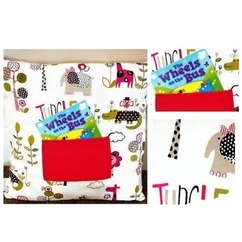 Storybook Cushion in Animal Print Comes with 'The wheels on the bus' child's book. -100% new materials - Good quality fabrics - Pouch to fit a book...or snacks, small toys etc... Make Story Time that..
Returns accepted within 14 days in perfect condition and in packaging. Buyer pays return postage. 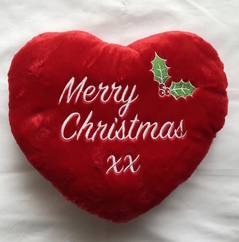 100% Cotton bunting, red and white Christmas design. 10 pennants 6" deep . Suitable for indoor or outdoor use, washable at 30 degrees. 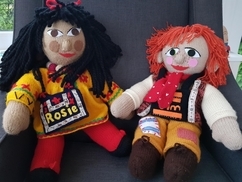 Beautiful bespoke lifelike hand knitted dolls from Rosie and Jim the British television Ragdoll characters Priced per pair Rosie height 52ms Jim height 49cms Each with removeable clothes Great care taken..
No refunds given for customised/personalised gifts unless item is damaged. Full refund if the item is returned within 14 days, in original packaging. A range of handmade scented reed diffusers. 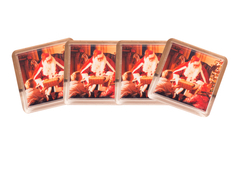 Each diffuser is hand made with cosmetic grade fragrances, and contains 96ml of fragranced oil. The reeds are non-flip, which means they never need to be turned.. Delivery will be made within 5 working days of purchase. International buyers please contact me to confirm a postage price before ordering. If there is a need to return your order, please do so within.. I love this necklace, I have linked both the Ceramic Brown mottled beads with the Apache Jasper stones to form a lovely hanging necklace. Using a floral designed link from the stones to the Brown para.. Highly scented Baby powder fragrance Top quality 100% natural soy wax. High concentration of fragrance. 100% natural. Please note due to the nature of the product some damage may occur in transit..
No refunds given for customised/personalised goods unless item is damaged. I will dispatch upon receipt of payment for items in stock within 1 to 3 working days. Commissioned items will be agreed with buyer upon purchase, typically please allow 3 to 10 days for delivery. Your..
�*All my boards, whatever the fabric used, are limited in the number I make in each design, so no two boards will ever be exactly the same. This is truly an individual product. This is a unique notice.. I accept returns within 21 days of purchase, the buyer is responsible for return postage costs. I do not accept returns on personalised items. 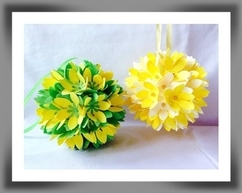 These pretty hanging decorations are made up of lots of individual paper flowers all attached to a polystyrene ball. The paper flower hanging decorations are available in a selection of colours and..
Elf Pix a newly created doll carrys a good luck message wand/broom and crystal in cage that can be removed and worn by the buyer.i also have purses with five crystals I have crystals for Fertility healing..
Returns accepted at cost to purchaser. Return must be unused and in original packaging. Refund of payment will be issued once item has been received. 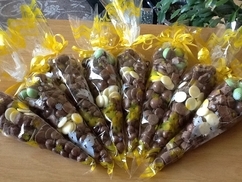 Cone filled with assorted chocolate such as twix, vice versa, twirl bites, galaxy counters, maltesers, aero bubbles, milk buttons, milky bar buttons, mars etc. Finished of with ribbons to suit any occasion.. Delivery will be made within 5 days of purchase, International buyers please contact me prior to purchase so I can confirm a postage price for you. If there was a need to return your order, please return..
Now this is a lovely necklace, Its approx 26" in length and I have used Blue Crackle frosted Agate beads as well as Rainbow/Hematite beads of which I have linked together. I have used a floral link.. Item is non refundable as it is made to order. Item will be normally be dispatched within a month of you sending the keepsakes to us but we will always do our best to get it to you sooner if you..
Baby Memory Frames Keepsakes from your baby's early days beautifully displayed in a 3D frame to treasure for ever. 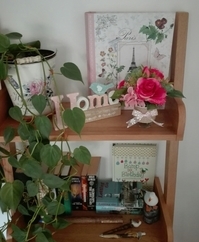 Our small frames are ideal for displaying single items such as baby's first booties.. Contact me with any issues in the first instance. I can personally deliver items locally. Returns accepted within 14 days of delivery only in perfect condition, please contact me before returning item. Purchaser pays return postage. 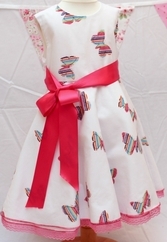 Colourful print fabric with Butterfly Button embellishment 100%cotton, coordinating lining and interlined for stability and strength, Chrome kiss clasp. Lovingly handmade, very limited production. Ideal.. 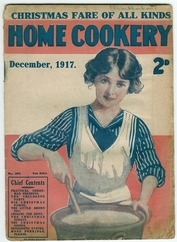 This paper back was printed in December 1917 it is good condition for the year.It has wartime recipes and is very detailed with 16 pages printed both sides. Standard Delivery to United Kingdom. 3 to 5 Working days. "My shed" Plaque 6" x 6"
Delivery will be made within 5 working days of purchase, any international buyers please contact me prior to ordering to confirm postage costs. Any returns need to be made within 7 days from receipt.. I think this is a great gift Idea for anyone! and relates to most people!! I made this using 3mm MDF with a mixture of paint effect work to create this style, I have used wooden spades and buckets.. Item must be signed for on delivery. Return within 14 days in unused condition in suitable packaging. Buyer to pay return postage. Custom made bouquets are dispatched within 3 weeks of ordering. Bouquets are sent via Royal Mail Signed For for UK addresses. Custom made bouquets are not eligable for refunds or returns. Orders can be..
An effortlessly simple and rustic overarm bouquet, perfect for a woodland themed or autumunal wedding! 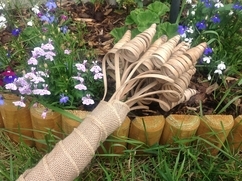 This handmade overarm bouquet is made from twenty natural cane cones which are wrapped in a hessian.. Delivery will be within 5 working days of purchase. Any International buyers please contact me prior to ordering to confirm postage costs. Any returns to be made within 7 days of receipt, where a full.. This Tree of life charm necklace is lovely, I have used Red and Amber Rondelle Glass beads with Benchmark multi coloured beads. With a Tree charm. I have used Black para cord with Lobster clasps. This.. Delivery will be within 5 working days of purchase, any International buyers please contact me prior to placing your order so I can confirm postage Any returns need to be made within 7 days of receipt.. These are a lovely Sea wave flat bead, on black wire. I have used Antique fish hooks for these as I thought they would set them off. 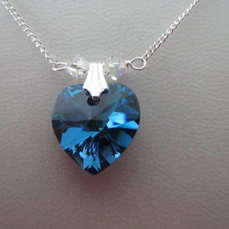 These are also available in "clip on style" if you would like them..
A stunning sparkly Swarovski crystal heart pendant supplied on an 18in Sterling Silver chain. Available in a wide range of colours. Items Are Ready To Be Dispatched In 3 Working Days. Items Will Be Posted And Tracked By Royal Mail And Must Be Signed For. 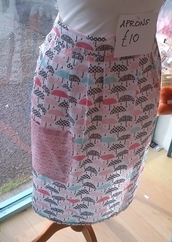 Returns Will Be Accepted Provided They Are Returned In Their Original Packing..
Gorgeous Fully Lined Cotton Butterfly Print Handmade Dress. Cut On A Full Circle For Added Twirl.Inner Lining Is Edged In Lace While The Outer Butterfly Print Cut Just Above The Lining Is Oversewn In.. This handmade bridal bouquet is full of rustic charm and would look lovely at a woodland, rustic or autumn themed wedding. 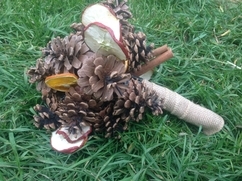 This bridal bouquet is handmade from pine cones, dried orange slices, dried.. Delivery of your order will be within 5 working days of purchase. International buyers please contact me for a postage price- thank you Any returns need to be made within 7 days of receipt of your order.. This pretty elasticated bracelet is approx 7" with Tiger eye Gemstones with Vintage ceramic beads and pearl effect acrylic beads. If you like this bracelet in a different length then please message.. Delivery will be made within 5 working days of your purchase, any international buyers please contact me prior to placing your order for postage price. Any returns need to be made within 7 days of receipt.. This red & black Millefiori Glass bead bracelet with red ceramic beads is such a lovely bracelet. The Millefiori beads are approx 10mm, this bracelet is approx 8" in length and I used tiny quartz beads.. 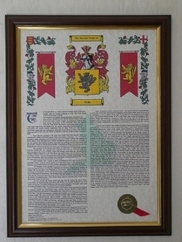 Adding a frame really makes a difference and will allow you to proudly display your Certificate. Choice of Gold or Mahogany. 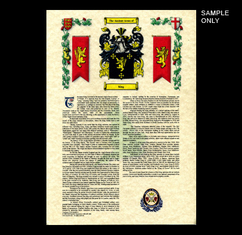 Our Coat of Arms & Surname History features a full colour Coat of Arms.. This small model available from us is easy to build and is fun to make. It comes as a kit with instructions to build. 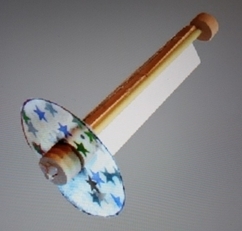 (Consists of: Plastic mirror scored into 3 parts, 3 wooden cog wheels, support square.. If you wish to return an item for a certain reason ,please email us for a replacement or refund within 7 days of receipt provided the item is still in its original condition and packaging.Please note..
Baby oil cloth changing set- *bib lined in corduroy *changing mat lined in corduroy *snack pad ,feed your toddler on a clean mat when out and about. *mini bag that can be used as a shooter/bike bag.. The product range I sell is varied, I make a range of cupcakes for adults, focussing on cocktail drinks, or adult themes. 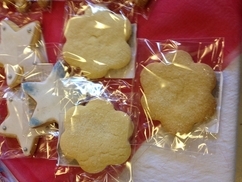 I also make a wide range of topic based baked products for children's parties.. Custom made bouquets are dispatched within 6 weeks of ordering. 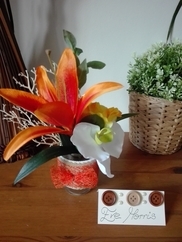 Bouquets are sent via Royal Mail Signed For for UK addresses. 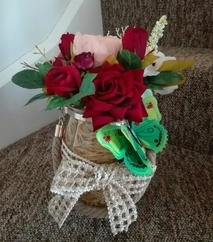 Custom made bouquets are not eligable for returns or refunds. Orders can.. It's time for tea with this quirky and alternative bridal bouquet! 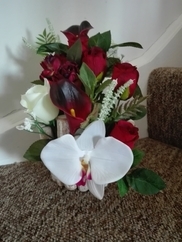 These bouquets are handmade to order and can be customised to fit in with your special day. The bouquet is made from vintage teacups.. Delivery will be made within 5 working days of purchase. International buyers please contact me prior to ordering for postage price. Any returns need to be made within 7 days of receipt, where a full.. This Leather bracelet is approx 7.5" in length, of which can be made to fit any size. I have used Amber acrylic beads with antique style spacer beads, with lobster clasp to fasten. If you like the style..
All items are dispatched within 3 working days after payment has been received. If you are not completely satisfied with your order you are able to return it. The item must not be faulty and in good condition..
A beautiful handmade anniversary card consisting of a decoupaged image of a bride and groom. 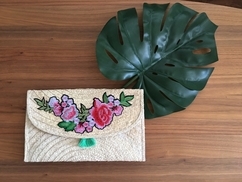 I have mounted the image on decorative backing papers and decorated the card with an organza ribbon and pink..
Beautiful embroidered and beaded, cotton lined, clutch/make-up purse. Interlined for stability and strength, Chrome kiss clasp. Lovingly handmade, very limited production. Ideal gift and suitable for..
�Orders over £10 include FREE Delivery (UK ONLY) �DELIVERY COSTS INCLUDE INSURANCE FOR LOSS OR DAMAGE �Delivery details and tracking codes will be provided �Allow up to 5days for delivery (inland..
Our Traditional Homemade Family recipe of a Mouthwatering Scottish Confectioneries are available in a variety of sizes and quantities � wrapping and packaging Personal � Corporate � Weddings - all Special..
Tooth Fairy Pillow / Cushion The perfect gift for your little one It has a handle so you can hang on the door or on the bed post. 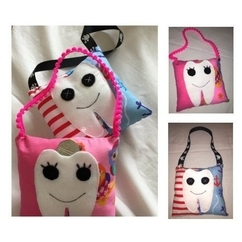 There is a slot on the front of the pillow in which you put the tooth.. Delivery will be made within 5 working days of purchase , any International buyers please contact me prior to ordering to confirm postage price. If there is a need to return your order, please return.. This Tree of life necklace has lovely Purple/Rose colour Murano glass beads, I have used Black pony beads with Purple silver lined glass Czech beads on a purple para cord necklace. This is available.. Delivery will be made within 5 working days of purchase. International buyers, please email me for a postage price prior to ordering. 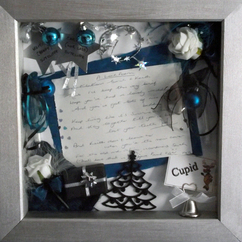 Any returns need to be within 7 days of receipt, where a full refund..
6"x5.5" Baby Boy Decoupage Plaque, faced with wooden letters & painted wooden baby,tiny sequins and a "handmade with love button" attached with dark blue ribbon with adjustable Blue Rondelle glass bead..
Live Laugh Love Anniversary Engagement or Birthday card. 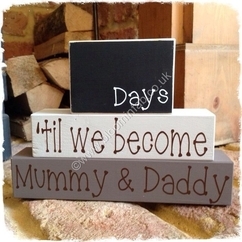 This large 8x8 inch (20.3 cm's) Each occasion has its own printed insert (verses below). 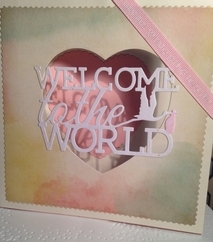 This white on white card has a heavily embosed mat..
Baby Girl- Heart shaped Plaque 6"x 5.5"
Delivery will be made within 5 working days of purchase. International buyers please email me for a postage price prior to ordering. Any returns need to be within 7 days of receipt, where a full refund.. 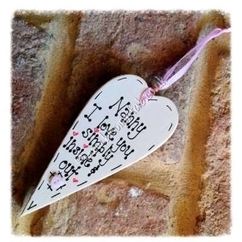 This is a great heart shaped decoupage plaque, faced with wooden letters and painted wooden baby, wooden buttons and painted back, as well as a "handmade with love button. Ideal for a new baby gift!.. I accept returns within 21 days of purchase, buyer is responsible for return postage. I cannot accept returns of personalised items. Unusual unisex get well card with printed verse insert. I started with high quality base card in a delicate spring green. I have used layers of silver mirri card and printed papers to give an unusual..
Returns Our policy lasts 30 days. If 30 days have gone by since your purchase, unfortunately we cant offer you a refund or exchange. 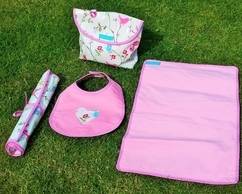 To be eligible for a return, your item must be unused and in the..
Baby changing mat in oilcloth / laminated cotton and fleece, for active babies and busy mums. 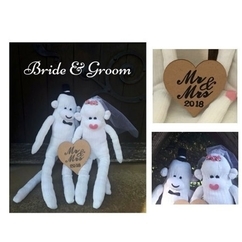 Dimensions - 45cm x 60cm approximately 1-in pink 2- in blue Please tell us the color you like in order for..
Bride & Groom Sock Monkey Couple - The Perfect Wedding Gift that will last a lifetime! 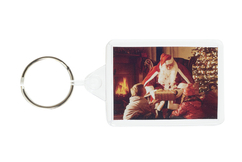 Make the Married Couple feel even more special by personalising with a message of your choice (max of 20 characters.. Delivery will be made within 5 working days of purchase, International buyers please contact me prior to placing your order for a postage price. Any returns need to be made within 7 days from receipt..
Now this bracelet is lovely, its made with Blue Jade Gemstone Crystals which symbolize Healing & Energy powers and are joined with ceramic Mottled effect beads. I have made this bracelet to a length..
Mini cones are filled with a variety of sweets, although I usually put in millions haribo's and marshmallows. These are vey small thin cones, ideal if you need a lot for an event as giveaways. Can be.. Item is non refundable as it is made to order. Item will be received within a month of you sending the keepsakes to us but we will always do our best to get it to you sooner if you need it in rush -..
Baby Memory Frames Keepsakes from your baby's early days beautifully displayed in a 3D frame to treasure for ever. 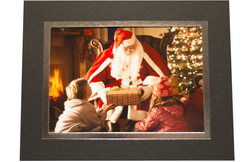 Our large frames are ideal for displaying a collection of keepsakes or larger items.. Delivery will be made within 5 working days of purchase, any International buyers please contact me for a postage price before ordering If a return is needed then please do so within 7 days of receipt.. This Dalmation Jasper gemstone necklace is so pretty, I have linked the gemstones with a mixed frosted gemstone onto a brown Para cord, with toggle clasp. I have made this necklace approx 21" in length.. Delivery will be made within 5 working days of purchase. Any International buyers please message me prior to ordering to confirm a postage price. Any returns need to be made within 7 days of receipt.. I love this bracelet and the Jasper flat beads, the colour is so pretty and by using the small frosted beads, sets this off for a lovely looking bracelet. I have linked all the beads and used a magnetic.. 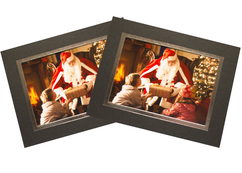 Delivered by hand locally or can be collected Delivered by courier or Royal Mail within 3-4 days Delivered by a parcel company within 3-4 days. Cannot accept refunds unfortunately due to the nature..
Cone shaped bag filled with various coloured millions, haribo's jelly's, fizzy haribo's jellys and various different marshmallows. Tided with curling ribbon to suit any occasion. Delivery will be made within 7 working days of purchase. Any international buyers please contact me prior to ordering to confirm postage. Any returns need to be made within 7 days of receipt, where a.. I love this bracelet ! I have used White Ceramic Porcelain beads with tiny transparent purple Miyuki beads. This bracelet measures approx 8" in total including clasps. However I can make this to fit..
Goods can be returned within 14 days in perfect condition, buyer pays return postage. 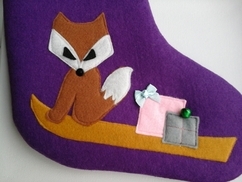 Beautiful handmade good quality felt Christmas stockings, felt applique with bow and bell embellishment. Although every care has been taken these items are not sold as a toy and should not be played..
No refunds available on customised/personalised goods unless item is damaged. 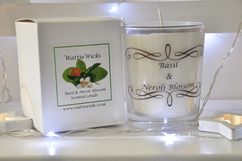 Soft Basil combined with fresh Neroli Blossom make this candle fresh and lively, and will enliven any room with it's uplifting aroma. The wax is blended, and the wick is coreless. The candle is 200g of.. Delivery to UK mainland only. Free if collected. This item will be dispatched within 7 days. Due to the personalisation of this item, no refunds or returns are allowed. 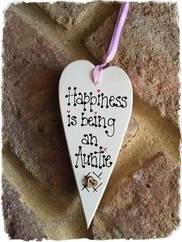 A unique and perfect gift for Christenings, Baptisms, Blessings or Naming Days. 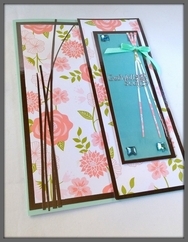 The gorgeous handmade album comes with matching presentation box covered with textured handmade mulberry paper. 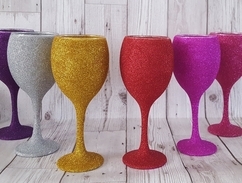 The guest..
**Winter sale rrp £9** Full glittered wine glass available in a variety of colours. Perfect gifts for birthdays, anniversaries, christmas or just to add some sparkle to your kitchen/ dining table..
Valentines marshmallow skewer with strawberry fizzy belts and a harribo heartthrob. If returned in original packaging, within 14 days, full money back. 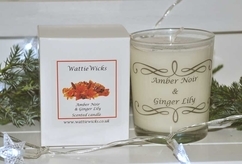 Lovely warm Amber with spicy Ginger give this scented candle unusual appeal. Made with blended wax, coreless wick and 10% of cosmetic grade fragrance, this Amber Noir and Ginger Lily will burn for about..
A handcrafted, wooden box diddly bo based on a cigar box design. This unique one string guitar has a great sound, enhanced by tiny air holes. It will come with a finger slide and plectrum. A name or other.. This easy kit designed by us is made from wood. The solar motor and cell are already installed ( NEW MODELS HAVE THE SOLAR CELL ON TOP OF THE FUSELAGE) and once the other pieces are connected and then..
Beautiful bespoke reclaimed wood hanging hearts with lights. They come in 2 sizes 16" height and 22" height. 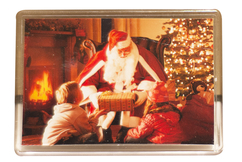 Lights are battery operated and can be Made to go outside. Would look lovely in any home or.. Custom made bridal bouquets will be dispatched within 3 weeks of ordering. Custom made bridal bouquets are not eligable for returns or refunds. Orders can be cancelled within 24 hours of ordering. 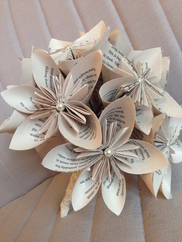 A handmade bridal bouquet made from a paper of your choosing to best reflect your personality on your special day! 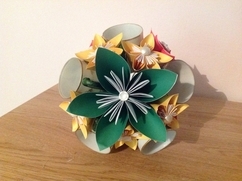 This paper flower bouquet is made from 15 origami kusudama flowers. The flowers are.. Delivery of your order will be within 5 working days of purchase International buyers please contact me for postage costs- thank you Any returns need to be within 7 days of receipt and in original packing.. These are a very pretty chain style earring which are approx 55mm in length. These are made of silver plated chain with red foil hearts with a lovely Tibetan flower and tiny seed beads for that pretty.. 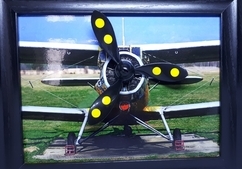 Solar Pictures - a variety of pictures in frames with moving parts powered by a solar cell. WINDMILL, PENNYFARTHING, AEROPLANE, TRACTION ENGINE, TRAIN, TRACTOR, MAGIC HAT, CLOCK. ETC READY FOR USE. These..
Freestanding word 'baby'. Painted, papered and embellished. Ideal for a new baby gift. Uppercase letters approx 6" tall and lowercase letters approx 4" tall Can be made in any colour or design.. Delivery will be within 5 working days of purchase. Any International buyers please contact me prior to ordering to confirm postage. Any returns need to be made within 7 days where a refund will be given.. This is a beautiful light weight Rondelle necklace, with a lovely tree of life charm, with benchmark beads on black para cord. I have used Lobster clasp to fix. I feel that this necklace can be used.. Items will be dispatched by First Class Post at the cost specified. However by prior arrangement some items can be sent by special delivery. 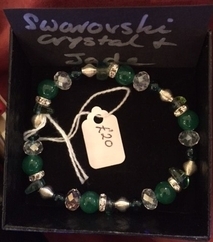 Returns are the responsibility of the person returning..
Clear Swarovski, Silver and Jade (Green) Bracelet. Handmade on think elastic to prevent breakage. Made using green Swarovski Bicone crystals, silver plated rondelles and green jade beads. Delivery will be made within 5 working days of purchase. International buyers please contact me prior to ordering for a postage price. Any returns need to be made within 7 working days of receipt, where.. This Black & White snowflake Obsidian bracelet, is a combination of these beads as well as using leather for part of the bracelet. I have made this bracelet approx 7.5"in length however this can be.. Dispatched within 3 working days. No returns unless damaged. 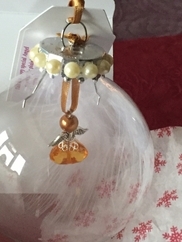 Handmade Unique Baubles featuring Guardian Angels, Hearts charms, Horseshoe charms, basket of flowers charm, Ballet Shoe charms and more. 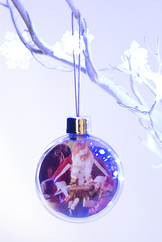 Each Bauble comes with a feather and is gift boxed. Gaudian Angel.. 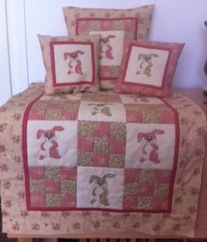 Your baby wall hanging will be lovingly wrapped and shipped to you within 2 weeks from receiving the order and payment. This wall hanging would make a lovely gift for a new arrival. 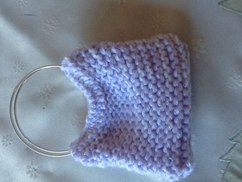 This particular item has now been sold however, one can be made to order. Please allow a turn around period of two weeks. Your own choice..
Elf Pix is a newly created doll and carry's a good luck message. Elf Pix can also carry a wand or broom and a crystal in a cage that can be removed and worn by the buyer.I also have purses with five crystals.. Delivery would be within 5 working days of order, international buyers please message me prior to placing order to confirm postage costs. Any returns need to be within 7 days of receipt where a full.. This is a lovely "True love" horseshoe made with 3mm MDF where I used a selection of techniques to create this effect. Finished with coloured wooden butterflies and a lovely red ribbon, with wooden..
Dispatch in 1-3 working days I hope you will be pleased with your purchase but If your not happy please contact me within 7 days to discuss return / refund. 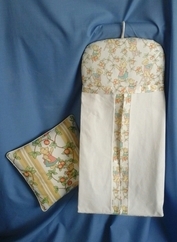 Nappy Stacker Cotton fabric Nappy Stacker dimensions H - 76cm, W - 35cm, front opening 51cm. Wooden coathanger inside top for easy hanging to cot, door, changing unit etc. Cardboard base concealed in.. 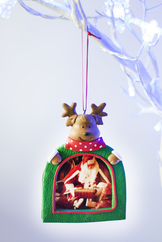 Please allow 1-2 weeks for personalised items to be dispatched. Due to these items being made to order returns only available if item is faulty. These gorgeous personalised unicorn drinkware items are the perfect gift for any unicorn lover. 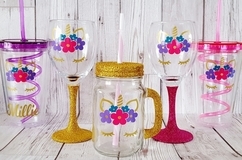 The unicorn range is available in plastic spiral straw tumblers, glittered mason jars and glitter stem wine.. 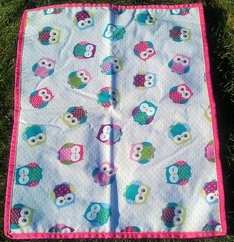 In the Pink this really lovey fabric is 100%cotton, lined and interlined for stability and strength, Chrome kiss clasp. Lovingly handmade, One only, so unique to you . 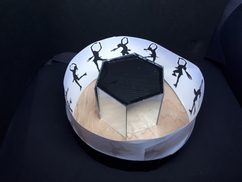 Ideal gift and suitable for make..
Victorian style animation kit This kit contains: base template, wooden disc, correx disc, 6 x mirrors, 2 hexagonal templates, motor in a wooden base, 4 different inlay pictures and instructions. 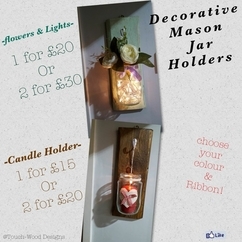 (pictures..
Bespoke,rustic,shabby chic candle/lghts/flower mason jar wall hanging. Look lovely on any wall. 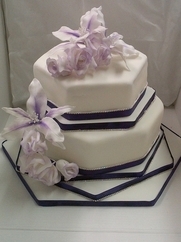 Idea for wedding,gifts or outside on a lovely summer evening Can have any colour choices e.g. Candle colour.. Delivery will be made within 5 working days of purchase, any International buyers please contact me prior to placing your order, so I can confirm a postage price for you If there is the need to return.. I think this is a lovely day to day bracelet that is easy to wear as well as lightweight. Using an Infinity style Tibetan link with the Navy Blue para cord, I have linked large jump ring connectors to..
Any orders will be delivered within 5 working days of purchase of purchase. Any international buyers please contact me prior to ordering to confirm postage costs. Any returns need to be made within 7.. These are a delightful set of earrings I have made these using Crackle Agate gemstone which offers energy & healing properties. I have used Antique fish hooks for fixing, however I can make these with.. Delivery of your order would be within 5 working days of purchase. International buyers please contact me in regards to postage costs. Any returns need to be made within 7 days of receipt and in original.. This is a very pretty Perfume bottle necklace- all hand made to accomplish a perfume bottle effect by using a lovely pink foil bead with small Matsuno silver filled beads, on a large open chain with..
Embroidered Heart Cushions with Motifs 35cm / 14"
Fantastic range of own design heart cushions with a variety embroidered motifs ie Merry Christmas (Red), Happy Birthday (Blue & Lilac), I Love You (Red), Happy Anniversary (Red), Thanks Mum(Red) - Size.. Delivery will be made within 5 working days of purchase, Any International buyers please contact me prior to placing your order to confirm a postage price. Any returns need to be made within 7 days of..
Now this bracelet I love! I linked all the beads together, to make a lightweight bracelet , made with Ocean Agate stones and Mixed frosted Agate stones. 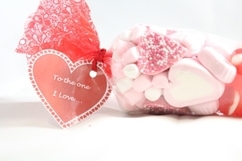 with a teardrop and heart charm to make a delicate..
Hamper contains a variety of different sweets, using the hand made products I make aswell as bought sweets. Hampers can include personalised mugs or glass wear, tshirts, numerous goods, they can also..
Dispatch in 1-3 working days I hope you will be pleased with your purchase, but if your not happy please contact me within 7 days to discuss refund / return. Cotton fabric Nappy Stacker dimensions H - 76cm, W - 35cm, front opening 51cm. Wooden coathanger inside top for easy hanging to cot, door, changing unit etc. Cardboard base concealed in fabric bottom.. 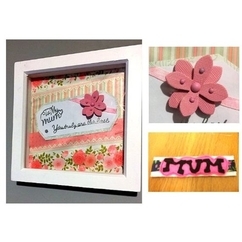 Decorative Box Frame + 'MUM' Keyring The Perfect Gift or Birthday Present for your Mum! Message reads: 'To my mum, you truly are the best' - All materials are 100% new - Frame is 20x20cm Let your..
Delightful Pug Dog print fabric 100%cotton lined and interlined for stability and strength, Chrome kiss clasp. Lovingly handmade, very limited production. Ideal gift and suitable for make-up, or all those.. Delivery will be made within 5 working days of purchase, international buyers please message me for more information regarding postage costs-thank you Any returns need to be made within 7 days of receipt.. This "Home" Plaque makes a lovely gift for someone, its made on 3mm mdf and I have decoupaged the background as well as some paintwork for effect. I have used twisted twine to hang with wooden buttons..
Freestanding word 'home'. Painted, papered and embellished. Uppercase letters approx 6" tall and lowercase letters approx 4" tall Can be made in any colour or design (message me with requirements..
Freestanding Mr & Mrs engraved with name and wedding date. Painted and embellished. 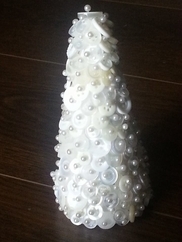 Ideal for a top table at a wedding or a wedding gift Approx 6" tall Can be made in any colour or design (.. Delivery will be made within 5 working days of purchase. Any International buyers please contact me prior to ordering so I can confirm a postage price. If a refund is needed please return within 7 days.. These Lemon floral lamp work heart shaped glass beads are a lovely pretty earring. I have set these on fish hook style earrings, however these can be made to fit clip on style if you would prefer. These..
As item is custom made, please allow up to two weeks for delivery. Should you wish your item to be tracked in the post please select the Signed For option. 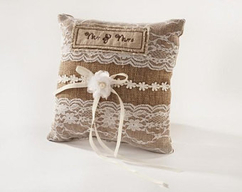 No responsibility can be taken for items getting..
Beautiful wedding cushion in beige with Lace ribbon on front of cushion Applied silk bow and embroidered Mr & Mrs Would make lovely wedding ring cushion of wedding gift Made from 55% Cotton 45% Linen.. Delivery will be made within 5 days of purchase. Any International buyers please contact me prior to ordering to confirm a postage price. If there is a need to return your order then please return within.. These necklaces are a pretty style with using the floral Blue Murano glass beads on Navy Blue para cord. Available in both Tree of Life and Star Fish, please select which one by using the drop down bar..
�REMEMBER ME� MEMORY BEAR. 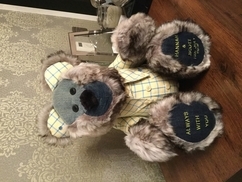 We make a bear totally bespoke to you, made from scratch with either cherished clothing supplied by you, or we can designed a bear to your specification and taste from our.. Delivery of your order would be within 5 working days of purchase. International buyers please contact me for postage costs-thank you Any refunds need to be made within 7 days of receipt and in original.. This seed bead necklace is approx 21" in length and is made up of purple seed beads with Matsuno clear silver filled beads. I can also make this to fit any size so if you are looking for an alternative..
100% cotton fabric and lining, interlined for stability and strength, Chrome kiss clasp. Lovingly handmade, One only so would be unique to you. 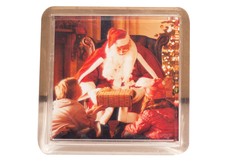 Ideal gift and suitable for make-up, or all those little.. Delivery of your order will be within 5 working days of purchase. International buyers please message me for postal costs. Any returns need to be within 7 days of receipt and in original packaging.. This 21" Cable chain is very pretty with its Blue foil heart pendant. Lobster clasp to fasten. If you like this necklace and would like a different length or different colour heart then please message..
Returns accepted within 14 days in original packaging and undamaged. No returns for custom made items after sample is agreed. Buyer pays return postage. Beautiful double sided baby bunting, polar bears, forests, mountains and snowflakes, all make this bunting a lovely item for a nursery or child's bedroom. Double sided and joined with cotton lace (looks.. Delivery will be made within 5 working days of purchase, any International buyers please contact me prior to ordering to confirm the postage price. Any returns need to be made within 7 days of receipt.. This lovely sea wave stone is so pretty and with the tiny Ocean agate stone on the end, I have twisted the wire on this on top & bottom and used tiny metallic glass beads to surround the Sea wave stone..
Cotton bunting with lace trim, single sided. 1 x Pink or 1 X Blue Pink bunting has an alternate plain pennant with button trim. 3 metres in length excluding ties and pennants are approx. 8ins (Pink)..
**Winter sale rrp £10** Gorgeous glittered stem wine glass with a choice of print. 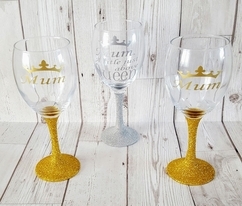 Choose between mum or mum- title just above queen. 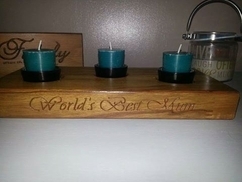 Ideal gifts to show the matriarch of the family how important.. 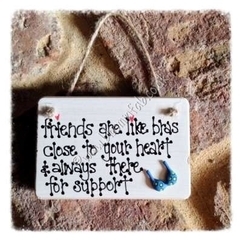 This is a lovely floral plaque with faded "friends" wording in wood and decoupaged background. I have used three coloured wooden butterflies and is fixed with a rustic twine to hang, there are wooden..
Free UK Delivery on all orders. You have 28 days, from receipt of cancellable goods, to notify the seller if you wish to cancel your order or exchange an item. Should you choose to return or exchange..
A unique custom made spiced tea infusion for your wedding. Samples will be sent and custom blends can be made! 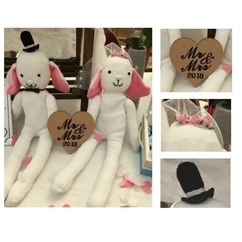 Spice Kitchen are proud to offer wedding couples a chance to create their own spiced tea..
Bride & Groom Sock Bunny Couple - The Perfect Wedding Gift that will last a lifetime! 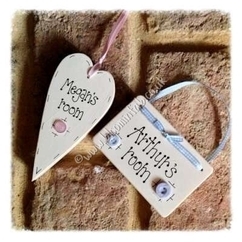 Make the Married Couple feel even more special by personalising with a message of your choice (max of 20 characters.. 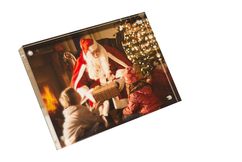 Delivered by hand locally or can be collected Delivered by courier or Royal Mail within 3-4 days Delivered by courier within 3-4 days No returns unfortunately due to the nature of the product. Round marshmallows half dipped in chocolate, then arranged alternately on a plastic stick, and decorated with whimps of white chocolate. Bagged and ribbons to suit any occasion. Golden glass jar with artificial red flowers. Item is non refundable as it is made to order. 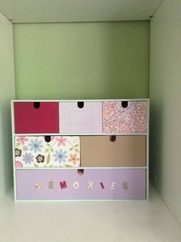 Item will be normally be dispatched within a month but we will always do our best to get it to you sooner if you need it in rush - just drop us an email..
Beautiful wooden drawers ideal for storing precious keepsakes or bits and pieces: New baby Wedding Sewing / craft room Stationery Make Up These items are made to order to suit any theme or style. The..
Chocolate lolly comes in milk, white and dark chocolate a variety of characters feel free to ask . Damaged or faulty goods may be returned within 14 days after prior notification. Please contact me should you wish to return an item. A lovely pressie for anyone who loves sewing, Vintage Blue Bone china teacup pin cushion, this is not fixed to the saucer making it easier to dust/clean. Tape, pins and cotton reels not included. Pic.. Delivery cost includes cost of the fingerprint kit to be sent to you by 1st class post, and your finished jewellery being sent back to you by special delivery. 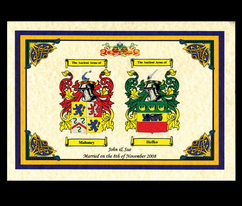 The kit will be sent to you within 3 days..
Our double coat of arms is a perfect present for a Wedding, Engagement or Anniversary. 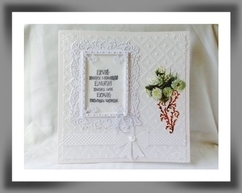 You have the choice of our Gothic or Celtic boarder and these A3 certificate can be customised with the date.. These earrings I think are great! these are made using Antique Fish hooks and are approx 40mm in length with Dyed Green shells and black beads. These are for every day or dress up for a night out! These..
A handcrafted three string guitar with a unique sound and which can be played acoustically or electrically. This popular design can be played using a plectrum and slide, ensuring you can produce the sound.. This is a great necklace, its chunky but light weight on a lovely silver plated cable chain. With open heart charm with Tibetan Flower and small clear heart. Very pretty necklace and could be worn as..